Congratulations to Cynthia Murdoch and Bill O'Connor, both members of the Portal project team, who completed the Office for Equity and Diversity's Advanced Certificate in Equity and Diversity. The certificate included 10 workshops, a year-long dialogue circle, and an application project. It is great for the Portal team and ESUP to have this strength. Thank you to Bill and Cynthia for dedicating the time and energy toward increasing your skills in these areas! Pictured left to right: Bill O'Connor, Susan Geller, Anne Phibbs (OED certificate program director), and Cynthia Murdoch. ESUP Assistant Program Director Mark Powell was on hand last week to receive delivery of two new sets of servers: Exadata and Exalogic. The first set, Exadata, will house the Oracle databases. When OIT upgraded to the current version of Exadata servers, users experienced significant performance improvement. The second set of servers, Exalogic, are new for ESUP. These servers will run PeopleSoft applications instead of the multiple servers currently used. 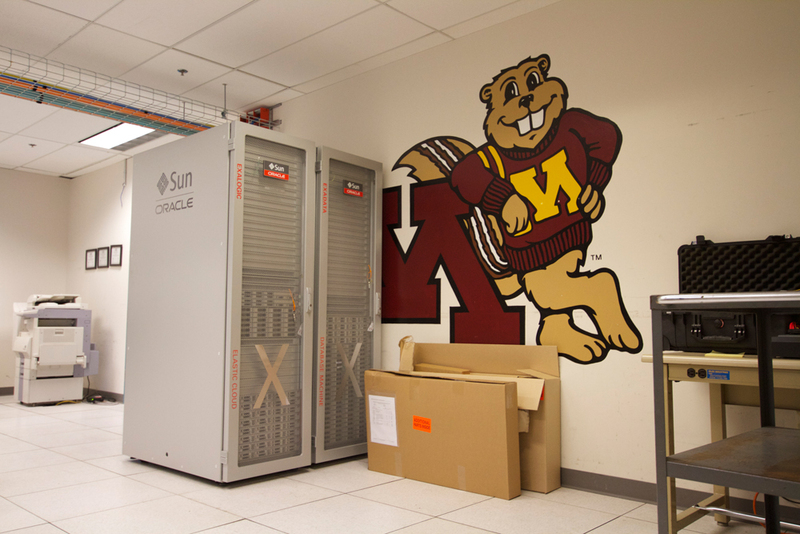 The Exalogic and Exadata servers are designed to work together and Oracle will provide additional patching and upgrade services for these servers, which helps reduce system administration resources and costs to the University. The servers will be split into two combined sets, pairing one Exalogic with one Exadata. The set in the WBOB data center will support ESUP’s production systems, while the second set (located in the 90 Church St. data center), will support the Program’s development, testing, and disaster recovery. The Portal Project Team has completed a matrix of portal opportunities and information about each opportunity. This is the result of four months of engagement starting with the kickoff in February, including over 50 listening sessions, seven design thinking workshops, input forms and a survey. It is not the end of opportunity gathering - the portal is still listening and gathering input critical to the success of portal. The Portal leadership team will review the matrix over the next few weeks to determine priorities for phase one. More information about the opportunities and the process will be available on the Portal website soon. The Finance team continues to schedule sessions for Phase 1: Plan and Discover. Sessions for Expenses will begin June 3 and are scheduled to wrap-up by June 13. Some of the business processes to be covered include travel authorizations, cash advances, and expense reimbursements. Treasury sessions also begin June 3 and are scheduled to end June 20. Some of the business processes to be covered on these sessions include bank administration, cash position/cash forecasting, bank reconciliation, settlements, financial gateway, managing and administering deals, and treasury batch processing/integration. Now that some business process decisions have run through the ESUP governance process, leadership staff have approved functional specifications and technical staff have begun development. This means a big change for many of the developers on the program, who will no longer be attending as many Interactive Design and Prototyping (IDP) sessions. Instead they will write code. Developers are still available upon request to attend IDPs or to do technical research when needed, but developers are builders, and they are happy to move out of the consulting role. Let’s all join the developers to toast the beginning of Phase 3: Configure & Develop! The Executive Oversight Committee will present an update on the status of ESUP to the Board of Regents at their June meeting. The Board meeting begins at 9 a.m. on Friday, 6/14 and is open to the public. The full schedule is available on the Board of Regents website. The HRMS work stream has launched its project website at z.umn.edu/hrms. The site will grow and evolve in the coming weeks, so check back often for the latest information on the HRMS upgrade! The Student project has been working on team well-being, identifying ways in which team members can take care of themselves and prevent burnout. Kudos to the Student work stream for tackling such an important issue! The Finance work stream’s General Ledger module has completed their Phase 1: Plan and Discover sessions and are completing the required deliverables.